I have been looking forward to taking my gorgeous six month old daughter swimming, but have had to hurdle some self-created obstacles to get there. The right temperature? I don’t have any swimming nappies! Do I put her head under? I need a second person to help get her in an out of the water! So, on the weekend, hubby and I seized what could be the last warm Melbourne day before the cold of winter descends, and took a tentative dip, as opposed to any kind of plunge. It was great! She had a great time, smiling and kicking, even though she was shivering a little in this strange new environment. Once her dad jumped in she even became shy! But she certainly enjoyed it. 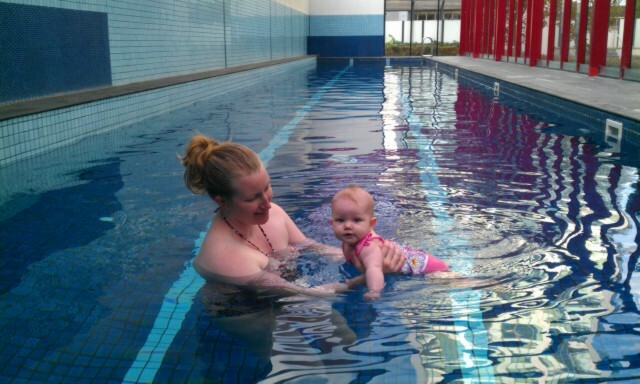 How did you go with your baby’s first swim? Did you take them for a dip newborn? Pop baby’s head under? I’d love to hear your thoughts on when to go under water, and when to start swimming lessons.